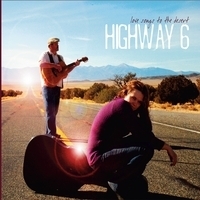 Highway 6 is comprised of daughter/father singer-songwriters Heidi and Tom Nedreberg, and Love Songs To The Desert marks their self-released debut. As far as local CDs and music go, it is quite accomplished and polished. Unfortunately, it is also a little too country for my ears, which makes it hard for me to review objectively, but I’ll try. Having a hand in either writing or co-writing all of the album’s fourteen tracks—save one—Heidi Nedreberg possesses a strong and clear voice, and her presence elevates most of the material here. Her father Tom’s voice is OK enough, but would have been best mixed lower, especially on the otherwise pleasant sing-along “The Bridge”. Instead, his vocal performance mars it nearly to the point of destruction. Much better is his sole penned track “Tammy’s Song,” which is greatly enhanced by daughter Heidi’s vocal contribution. Fortunately, Heidi is the main vocalist, and while many of the tracks suffer from sounding too similar to one another, some of her solo-penned tracks are of particular note, like the Spanish-tinged “My Water” and the lovely “Reclaim Arizona.” With both father and daughter playing guitar, the band’s sound is fleshed out with Matt Rushton on lead guitar, Kyle Johnson on keys and Ted Townsend on drums. Like a twisted Donny and Marie, papa Tom rocks a little bit and daughter Heidi leans heavily towards her country side, but clearly because of her voice and songwriting, she is the main attraction here.